This image of sulfate and water ice deposits in the Olympia Undae region of Mars was taken by the Compact Reconnaissance Imaging Spectrometer for Mars (CRISM) at 2213 UTC on October 2, 2006 (6:13 p.m. EDT) near 81.6 degrees north latitude, 188.9 degrees east longitude. CRISM's image was taken in 544 colors covering 0.36-3.92 micrometers, and shows features as small as 20 meters (66 feet) across. Olympia Undae is a large dune field that stretches some 1,100 kilometers (684 miles) across the northern polar region of Mars, just south of the ice cap. The region holds a vast expanse of complex, shifting dunes and is best described as a sand sea or erg similar to the Sahara. The two images above provide interesting clues into Mars� history by revealing the planet�s wet past and frozen present. The left image is an infrared, false-color image that reveals dark-colored dunes overlying a lighter substrate. Spectral data from CRISM and its sister instrument OMEGA suggest similar compositions of these dunes and the dark basal, or lowermost, unit of the north polar layered deposits. HIRISE images revealed cross-bedding (crossed layers that are oriented at a different angle to the main layer) in this dark unit. On Earth, cross-bedded sediments can form in both windy and watery environments. The dark polar basal unit on Mars is interpreted as a sand sheet underlying and pre-dating the ice, and now being eroded to dunes by the Martian winds. The mineralogy of the Olympia Undae region holds a record of past water. 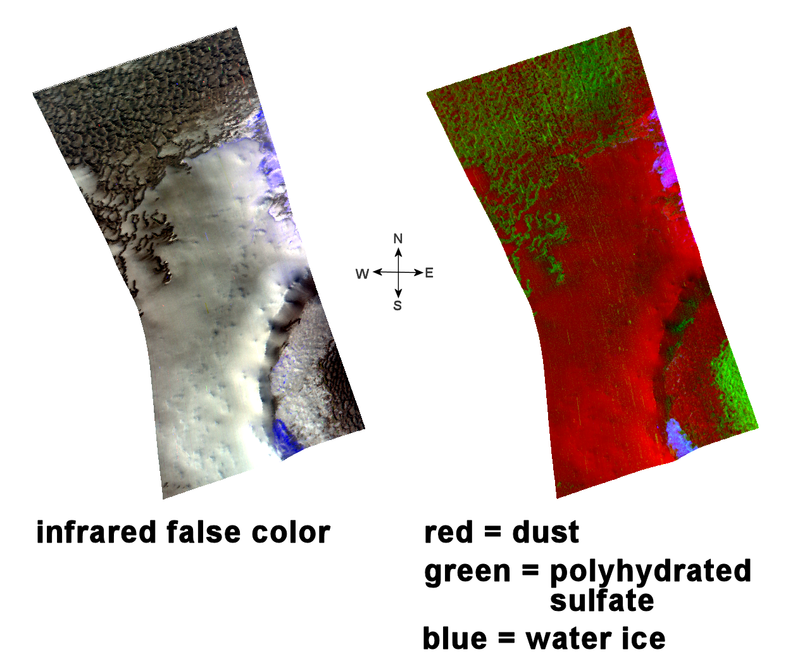 CRISM spectral data (right image) shows that the darker dunes are rich in polyhydrated sulfate (sulfates with more than one water molecule incorporated into each molecule of the mineral). The mineral gypsum is a polyhydrated sulfate, and the most likely constituent in these dunes. The gypsum probably formed by evaporation of ancient, saline water or by aqueous alteration of the silicate portion of the dune material. Areas shaded in red are cover by dust. Blue areas in both images indicate water ice, outliers of the polar cap that persist well into or even through the Martian summer. CRISM has observed these water ice outliers in shadows on north-facing slopes that are located at relatively low latitudes. In the images above, water ice is found on the northern slopes of both the inner and outer portions of a crater rim. CRISM also found that these icy outliers are concentrated in bright areas that reflect more of the sun�s warming rays and thus stay cold, and that they are less common in darker regions that absorb the sun's ray and become warmer. The combination of hydrated sulfates and water ice provides an interesting view into Mars� geologic history. In one image we see a record of past water trapped in sulfates and present water persisting as surface ice. As CRISM continues to gather data about the mineralogy and atmosphere of Mars, a clearer picture of the planet�s wet past and frozen present emerges. To learn more about CRISM�s observations of persistent water ice see: Persistent Summertime Water Ice Deposits in the Northern Plains , or read a PDF version of the scientific paper presented at the Lunar and Planetary Science Conference in March 2008, CRISM Observations of Persistent Water Ice Deposits in the Northern Plains of Mars (1885.pdf).